LISETTE OROPESA (SUSANNA), DANIEL OKULITCH (COUNT ALMAVIVA) + EMILY FONS (CHERUBINO). I told a close friend that I would be seeing The Marriage of Figaro again this year in Santa Fe. Probably the same production we had seen together in 2008. “Oh, you mean the one with all the bushes,” he said. “I simply do not remember any bushes,” I said. Well, there was no rain last night, but the view was just as stunning as ever. I resisted the temptation to take an iPhone photo. Some others did not, and I commend the management for policing amateur mobile phone photographers with their pointless and annoying flash functions. As for those flowers: virginity and the loss of it is one of Figaro‘s major themes. Figaro is marrying Susanna and we first see him eagerly measuring the floor where the bridal bed will be placed. Susanna thinks the room is a little too conveniently located next to the Count’s. Indeed, Count Almaviva would like to see the flowers plucked away from almost all the attractive virgin maidens on his estate. Flowers, by the way, are essential elements of a wedding ceremony. And flowers also grow in dark summer gardens where lovers can tryst. Can plucked flowers be replaced (something that actually happens in Act Four in this production)? Perhaps if the Count has a change of heart. Because the opera revolves around Count Almaviva’s Spanish feudal domain over which he presides with iron authority, and because he has the power to renounce an old law that permits him to sleep with any virgin maiden before her wedding, I suppose we’ll accept all of scenic designer Paul Brown’s symbolic overkill without complaint. Besides, elsewhere his ideas are beautiful to look at and quite successful. The stage-long stretch of tan wooden panels in Act One may be a tad dull (and seems to move pointlessly across our view like a slow freight train), but the Countess’s bedroom of Act Two is handsome grey Baroque confection, and the Count’s summery crystal hallway of Act Three is strikingly effective. Of course, the final garden scene with people pretending to fumble around in the darkness is always hard to pull off – and in this show we were back to tripping over flowers, quite literally at times. In any case, the period costumes are smashing (especially the Count’s outfits), and the stage direction sensible and – glory be! –non-obfuscating. Too often these days opera-goers cannot figure out the basic story. What was more than a little disappointing last night was that the entire performance, despite a cast possessing an almost uniformly high level of dramatic and vocal skills, failed to give us any truly stand-out characterizations or moments of glorious singing. It was all very good, mind you, but destined to be forgotten — at least by this reviewer. I will always remember Gustavo Dudamel conducting Figaro with the LA Phil in Disney Hall last May (with Edwin Crossley-Mercer, Christopher Maltman, Dorothea Röschmann, Malin Christensson, Rachel Frenkel, Ann Murray, and John Del Carlo), although to be very fair, Christopher Alden’s semi-staging of that production was a confusing mess. SFO’s current show benefits from stage director Bruce Donnell’s determination to make the Mozart/Lorenzo da Ponte comedy perfectly clear and wonderfully true to the creators’ wishes. If there were such a thing as an Opera Non-Obfuscation League, they could award Donnell a top prize for making perfect sense of the story and avoiding inane Regietheater hijinks. Another friend of mine has dubbed Christopher Alden “the axe murderer of opera,” a title he shares with his identical twin brother, David. I liked mezzo Emily Fons quite well as Cherubino, although I felt she worked a bit too self-consciously at trying to seem like a boy. Her “Voi che sapete” and “Non so più cosa son” were fine, but I felt they could use a touch more depth of feeling — and, to me at least, the voice seemed quite light for a mezzo. First impressions are hard to discuss. I was a little surprised that I was not more excited by baritone Daniel Okulitch’s Count Almaviva. He is so tall and striking looking, I wanted more richness of tone. He gave the Count a polished if fairly standard characterization. With regard to acting and vocalism, I have to say the same for the Figaro, baritone Zachary Nelson. I think both men can give more than they did last night. Nelson surely has a fine career ahead of him; he has only recently emerged from the SFO apprentice program and has secured some prestigious future engagements in Dresden. 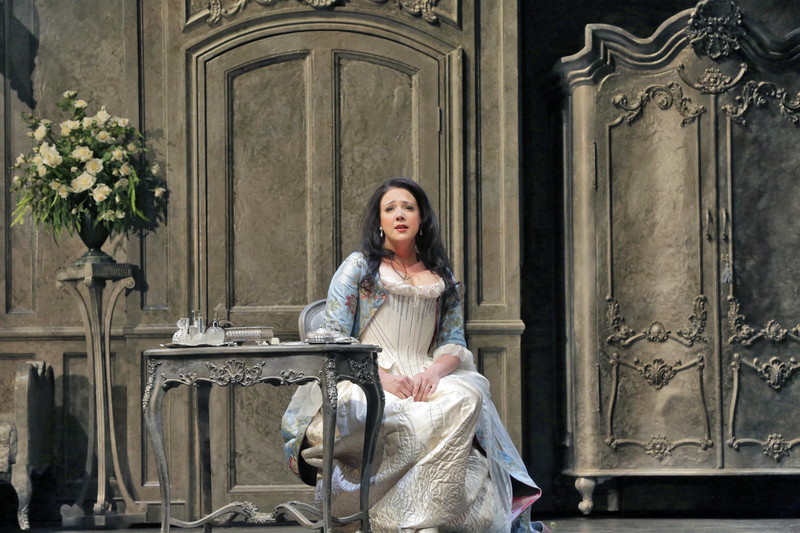 Veteran mezzo Susanne Mentzer is perfect (as usual) as the fanciful Marcellina who, while not wedded to her partner in crime, Doctor Bartolo, pursues marriage with Figaro before she is revealed to be Figaro’s mother. Basso Dale Travis acts the “old pro” in this comicality blustery part, although the voice sounds slightly frayed at times. To end on an upbeat note, soprano Rachel Hall was a perfectly charming Barbarina, and tenor Keith Jameson a highly amusing Don Basilio. It’s odd to say but — meh! Just a really good Marriage of Figaro, yet somehow not very special. 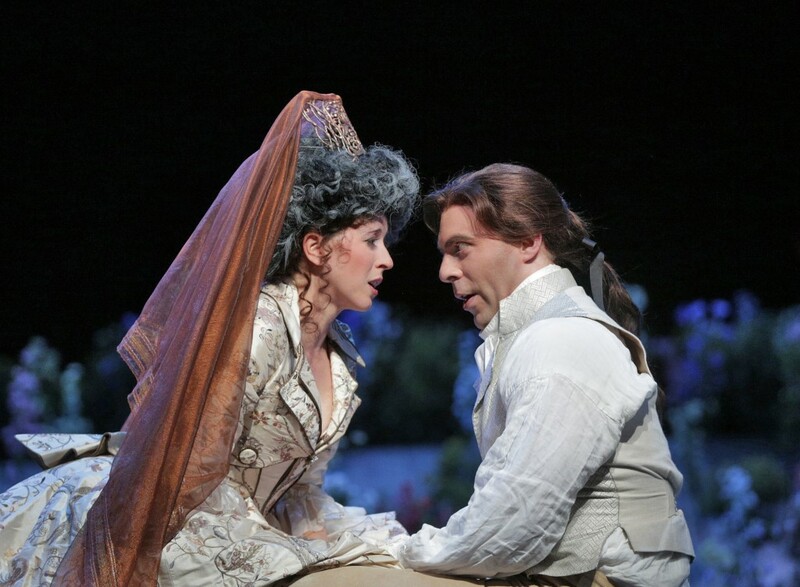 LISETTE OROPESA (SUSANNA) + ZACHARY NELSON (FIGARO).